A grant program that provides millions of dollars annually to help needy residents fix up their homes is now under audit by the U.S. Department of Housing and Urban Development. A grant program that provides millions of dollars annually to help needy residents fix up their homes is now under audit by the U.S. Department of Housing and Urban Development (HUD). The NBC Connecticut Troubleshooters first reported on the state’s Small Cities program last summer after receiving a slew of complaints from homeowners in Seymour, who said they received substandard contracting work paid for through the program. These homeowners turned to the NBC Connecticut Troubleshooters after months of complaining to town officials and the state department of housing and the team's investigation raised questions about loans used to make the repairs. After NBC Connecticut contacted the Department of Housing, they reached out to the homeowners with resolutions. On Thursday, the NBC Connecticut Troubleshooters learned the HUD Office of Inspector General is auditing the Small Cities program to see whether it is being administered according to their rules. 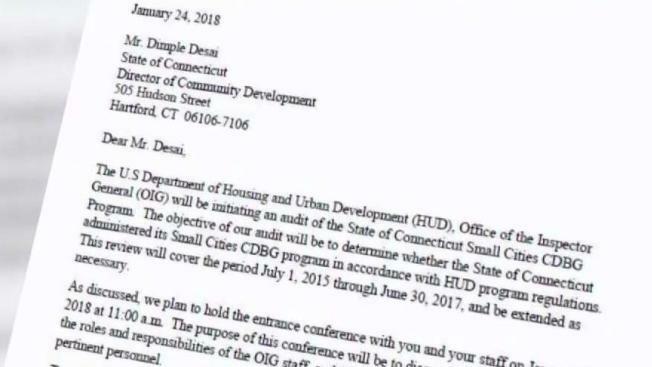 This comes after a 2016 audit into a related program, also overseen by the Connecticut Department of Housing, questioned the spending of more than $2 million of federal taxpayer money. In a statement, a Department of Housing spokesperson called this a routine audit and said the program has not been reviewed in 15 years. He added they have no reason to believe this review is based on any specific problems. A spokesperson for HUD said the audit report should be completed by September. The Small Cities program is one of several Community Development Block Grant programs administered by the state Department of Housing with funding from HUD. In 2017, $11.5 million was awarded to 20 municipalities in the state. Those municipalities then offer the funds to eligible homeowners in the form of low-interest loans.